Networking Strategies for Introverts | KMG Consultants Inc. Sometimes networking isn’t a choice. Your job may require you to make networking connections as part of your regular duties. Introverts are made uneasy about social tasks in general and possibly more so when they’re a requirement. Don’t panic. We’ve assembled some strategies that will help introverts become more comfortable at networking events. Give them a try and start improving your skills this week. The anticipation of a networking event is often more painful for introverts than attending the actual event. Reduce your fears by getting them out of your head with a trial run. Set up a practice session with friends, family, and coworkers. What are you most afraid of? Act out your nightmares and you will reduce your fearful anticipation to manageable levels by developing coping responses before hand. You may not eliminate your fear, but you will reduce it. Networking is frightening for introverts because the worst situations we’ve imagined feature long conversations with lots of different people we don’t know. Relax, you don’t have to have a lot of long conversations. It’s perfectly reasonable to approach people at the event to say hello and request their business card and offer yours and then move on by simply explaining that your time is limited. People will appreciate your efficiency. Let them know that you’ll contact them later and then remember to follow up within the next day or two with an email, a useful resource, or an invitation for a cup of coffee. Develop a few questions in advance based on the event topic to develop conversations starters. Write out your questions on cards and become familiar with them before the event. You can add some bullet points related to these questions for further discussion. Your goal is to develop familiarity and ease with your topics before the event. Practice asking the questions and answering them out loud to increase your comfort levels. It’s often possible to use your existing contacts or to contact the event’s organizers to find out who will be presenting at or attending the event. Use this information to craft a list of people who you would like to meet. Pick a number from one-to-ten and decide to meet only the number of people you’re honestly comfortable meeting. Be honest with yourself. If you can only handle one person at a time then only plan to introduce yourself to one person. If you attend 4 networking events in one month then that means you’ve made 4 new contacts. Introverts find social media to be great tool when they want to reach out to colleagues, coworkers, and contacts without increase the stress created at face-to-face events. Use LinkedIn or Facebook to reach out to your friends if you want an introduction to someone at an upcoming event. Connecting through social media allows you to start a conversation before the event that you can continue when you meet in person. The hard part is already done! 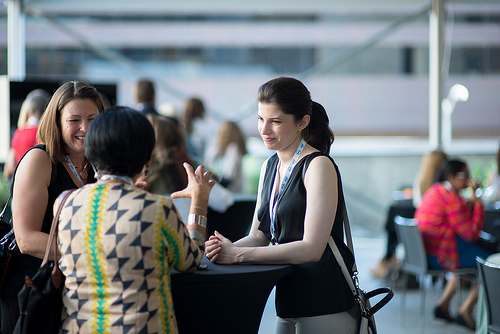 Networking is easier for introverts if they’re part of the event from the very beginning. By becoming part of the event as a volunteer, organizer, or presenter you are able to build connections from the inside out. Often you will be invited to participate in training events prior to the event that will allow you to practice reaching out to others in your professional community in a low-pressure situation. If you have a particular area of expertise consider leading a workshop or talk, which are both great ways to make a big impact at one event in a limited focus.